Creating COM and OLE diagram with free templates and examples. COM and OLE diagram has never been easier. Component Object Model (COM) is a binary-interface standard for software components and it is used to enable intercrosses communication and dynamic object creation in a large range of programming languages. Object Linking and Embedding (OLE) is framework for a compound document technology, and it allows embedding and linking to documents and other objects. In Edraw Max, the COM and OLE template and shapes are in the Software folder. 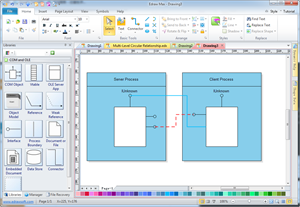 Edraw software contains special shapes and settings for creating COM and OLE diagrams or diagrams of public exposed interfaces, COM interfaces, and OLE interfaces in object-oriented programming. Edraw is a powerful yet simple-to-use drawing tool. Benefiting from smart drawing pens and rich built-in symbols, it becomes fairly easy and comfortable to create COM and OLE diagrams or diagrams of public exposed interfaces, COM interfaces, and OLE interfaces in object-oriented programming. It saves you more time and energy than other tools. The intuitive interface and automated tools make you easily customize your drawings to fit your needs. Edraw software offers you plenty of COM and OLE symbols, COM object, vtable, OLE server, object model, reference, weak reference, interface, process boundary, document or file, embedded document, data store, connector, boundary, etc.